To all the shutter bugs out there, have you ever witnessed a good deed being performed by some really awesome kind souls that you wished you can celebrate their noble acts with the rest of the world? Now you can! 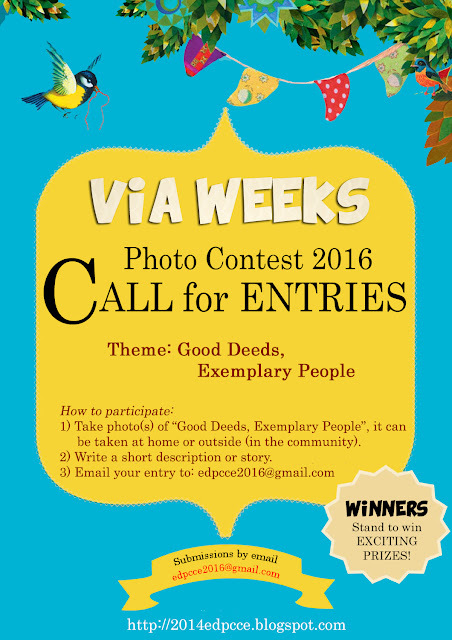 In conjunction with the VIA Weeks, the VIA department has launched a photo contest for all students who are keen to take part in the contest to snap photos showcasing the good deeds being performed by people around you. They can be your family, your friends, or members of the public. And the place can be anywhere, be it your home or outside. The theme of this photo contest is "Good Deeds, Exemplary People." The closing date for this contest is Term 2 Week 10 and winning entries will be showcased on our CCE-VIA Blog and gallery, and most of all, attractive prizes will also be given out to the winners! So, do not wait anymore! Go out there and snap photos of some wonderful people doing really nice things for others and you may be the one who wins!